A long-forecast and dreaded announcement came this morning from the head of the “Change” Administration himself. Hill oversight of the activities which they undertake. Former Democratic activists who worked against Obama’s nomination are among those most aware of the alarm bells this currentmove to suppress opposition sets off. His online primary campaign, which generated maximum impact via use of high tech applications-is recalled by many for its brutality and vicious conduct against web opponents in 2008. Several reported personal threats while many more indicated repeated disruption of their blogs and large-scale attacks on their forums. Throughout the campaign season, an online army of campaign-paid web thugs were hired for these intrusions, as reported and verified by FOX News. Intimidation, verbal threats, gutter language and even obscene images were the order of the day. Those in the know, then are acutely aware, then, that the “threats to security” listed by this Head of State in his televised speech today ironically coincide with tactics similar to some his own campaign used to get elected. An Obama small-dollar-on-line donor even reported receiving a phone call on his unlisted cell phone to remind him of a “Meet Up” in his own neighborhood – this despite the fact that the donor had not supplied the campaign with either his cell number nor his physical address! At least one Nigerian husband and wife both confessed last year to using their executive positions with international tech corporations to obtain personal records of U.S. citizens for use in harassment by the “Change” campaign. In the meantime, while specifics of the new leader’s rationale remain to be seen, it’s already foreshadowed they will be as far-reaching as possible. Obama’s sweeping statements about the urgent need to protect everything from banking records, to online purchases to information exchange. Rumors have indicated that the NSA is also disturbed that this new report-to-President only position would also circumvent this agency’s normal role in cyber-watching. Further evidence of the long-term planning of this eradication of online privacy plan lies in the fact that Senators Rockfeller and Snowe introduced a bill in Congress on April 1st to give the White House these cyber-space powers. next? And lest we wonder who might be put on the Cyber Czar’s Watch List, just remember the recent Homeland Security Warningthat “right wing extremists” (ie any citizens identified as”Change administration opponents) are now a grave threat. Even a child could connect quickly connect the dots between that recent DHS Alert and the press conference on cyber-security threats today! it’s not hard to guage whose “security” seems to feel most threatened. The only question that remains is how much more terror – against free enterprise and freedom of speech – will We the People permit the “Change” Administration to undertake?! “court of appeals is where policy is made.” “And I know — I know this is on tape, and I should never say that because we don’t make law. I know. O.K. I know. I’m not promoting it. I’m not advocating it …“. Policy is made by the President, law is made by the Congress and interpreted by the courts. The quoted statement displays both arrogance and an attitude of judicial activism, both of which should militate against this nomination to the Supreme Court. Issues of racism & sexism may be less directly related to the appointment, but they do reflect upon judicial temperament. The New York Times has an interesting quote and links to an article with more details. At U.C. Berkeley, in ’01, Judge Sotomayor said this. The issues of race & gender identity politics is clearly raised. So much for judicial objectivity. The link above is to the fourth of five pages containing the transcript of the lecture. There is plenty of significant detail bearing on this issue; I encourage you to read it. In the context of a law scholar’s quote, attributed to Justice O’Conor (doubted by Sotomayor), she expresses disagreement with a statement that a wise old man and a wise old woman would come to the same conclusion. This quote comes from the fifth page of the transcript. With that, Judge Sotomayor threw objectivity out the window and took a firm stand on the race & gender platforms. The last two paragraphs give us a great deal to contemplate, including this. At the bottom of each page of the transcript, there is a menu linking to the other pages so that the two links I have furnished above give you access to the entire transcript. I encourage you to read it before advising your Senators how to vote on this nomination. The ABA Journal has information about two of Sotomayor’s important cases. If you have the motivation and patience to delve into her decisions, visit SCOTUS Blog. Jim has commented on Obamination: National Insecurity. The “waterboarding” performed by convicted Japanese took two forms. One form was similar to that used by the CIA, but had two significant differences. The Japanese continued the treatment until their victim had a belly full of water, then they beat him or stomped his belly. Did the CIA fill Khalid Sheikh Mohammad with water? Did they beat him? Did they stomp him? The second form involved tieing the victim to a ladder, with his throat up against a rung and his head hanging below the ladder. In that position he was dunked in a tub of water, submerged until he passed out. The victim was then revived and immersed again. My source for that information is a post at Investor’s Hub. In this Times Online article, linked in that forum post, a British officer who survived the water torture describes his experience. If you would like to know more about the torture performed by the Japanese who were convicted and hung, summon up all your intestinal fortitude and click this link. Critical elements of the Japanese torture are missing from the CIA waterboarding, which was carried out with medical supervision and monitoring and did not involve saturation, beating or other physical injuries. Jim is comparing interrogation to torture, ignoring the details which differentiate the two practices. It is obvious that he is ignorantly or maliciously repeating enemy propaganda. The moralistic tone of his comment leads me to conclude that he acts out of malice, not ignorance. Two excerpts from that commencement address stand out below the rest; I quote them here. In a culture where so many chase the outward markers of success that can so often lead us astray — the titles and status, the materialism and money, the fame and popularity — these Americans have embraced the virtues that we need most right now: self-discipline over self-interest; work over comfort; and character over celebrity. Sometimes a con man, in his conceit, will effectively confess his crimes to his victims, firm in the belief that they are too dull to fully comprehend what he is saying. I view that first quote as a prime example of that hubris. President Obama expected that the graduates were too excited and we were too lazy to plumb the depth of his words. The following outline may help you to observe how those words apply to the man who spoke them. Yesterday I visited the National Archives and the halls that holds our Constitution, our Declaration of Independence, and our Bill of Rights. I went there because, as our national debate on how to deal with the security challenge that we face proceeds, we must remember this enduring truth: The values and ideals in those documents are not simply words written into aging parchment, they are the bedrock of our liberty and our security. We uphold our fundamental principles and values not just because we choose to, but because we swear to; not because they feel good, but because they help keep us safe and keep us true to who we are. 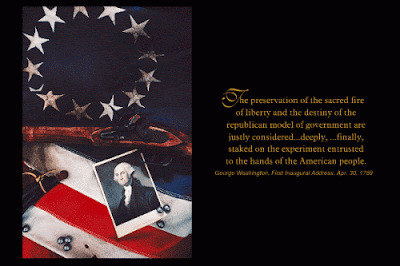 What principle is more fundamental to this nation than individual liberty? What safeguards it more than strict limits on the power of governments? Have we so soon forgotten his egregious remarks about the Constitution’s charter of “negative rights” which supposedly prevent the federal government from doing what it should for us? Because when America strays from our values, it not only undermines the rule of law, it alienates us from our allies, it energizes our adversaries, and it endangers our national security and the lives of our troops. So as Americans, we reject the false choice between our security and our ideals. We can and we must and we will protect both. That last quote packs broad meaning into a few words. Lets take a closer look. It is clear, from the context, that that phrase is a reference to water boarding. The value alluded to is justice. Our system of justice seeks to determine fact and law by investigation, inquiry and reasoned debate. It assumes innocence until guilt is proved beyond a reasonable doubt. Torture may be an interrogation technique, but it is also a punishment; we don’t punish the innocent. This points to two deadly assumptions. Both of those assumptions are obviously false. While waterboarding inflicts fear, if done properly it neither causes undue pain nor inflicts permanent injury. It is not equivalent to drills, knives, pliers or hot irons. Anyone who graduates from a terrorist training camp and carries a weapon on the battlefield is not innocent. Khalid Sheik Mohammad planned the abomination of 9-11-01. Not being a U.S. citizen or legal resident alien, he has no Miranda rights. He has no right to the presumption of innocence. He is action was not a misdemeanor, it was an attack carried out as part of a war. Those who are alienated are not and were not our allies, they were fair weather friends. Our weakness; our failure to seek and obtain clear victories in Korea & Vietnam emboldened our enemies and distanced broke the links with our allies. The photos of prisoner abuse and stories of ‘torture’ are grist for propaganda mills, but they are not the cause of enmity. The act of resisting Islamic aggressions supplies all the energizing they need. Our security is endangered by failure to recognize, identify & accurately classify the enemy. The lives of our troops are endangered by sending them to invade where we should have sent tactical nuclear missiles. Wisdom dictates swift, total destruction of wasp nests, not poking them with sticks. Real Americans reject it; President Obama, a self proclaimed ‘citizen of the world’, embraces and nurtures it, exploiting it for political gain at the expense of our national security. To witness the difference between a demagogue and a statesman, read the transcript of former Vice President Richard B. Cheney’s remarks to the American Enterprise Institute. “It’s absolutely a surprise. I’m shocked by it. I’m disappointed by it,” said Tim Lambert, who owns nearly 164 acres that his grandfather bought in the 1930s. The park service plans to condemn two parcels totaling about five acres — land, he said, he had always intended to donate for the memorial. “To the best of my knowledge and my lawyer, absolutely no negotiations have taken place with the park service where we’ve sat down and discussed this,” Lambert said. Lambert said he had mainly dealt with the Families of Flight 93 and said he’s provided the group all the information it’s asked for, including an appraisal. That land has been paid for with 40 lives … the donation box is an insult to that cost. “I think Svonavec believes his land, because it has the blood of my cousin and 39 other people, it’s worth more,” he said. “That’s an absolute, unequivocal fabrication that is being portrayed as fact,” said Edward Felt’s brother, Gordon Felt [about the 44 blocks claim]. He says he is insulted people would believe he would participate in anything that honored his brother’s killers. In The Church of Liberalism, Ann Coulter slammed the media for granting the Jersey Girls an “absolute moral authority” card, not questioning the Girls’ practice of blaming the Bush administration instead of al Qaeda for their husband’s deaths on 9/11. The Jersey Girls were bad enough, but nowhere is the flag of victim-hood being used to cover up more bad behavior than at the Memorial Project. Active cover-up of an ongoing Islamic supremacist plot Like the Jersey Girls, the Memorial Project gives Islam a pass for 9/11. Project members might not have known about the Mecca-orientation of the Crescent of Embrace, but they DID know that it was a giant Islamic-shaped crescent. Now they are doing far worse. Now they DO know that the giant crescent points almost exactly at Mecca, and are consistently misleading the press about it. Their own Muslim consultant told them not to worry about the Mecca-oriented crescent, claiming that it can’t be seen as a mihrab (the Mecca-direction indicator around which every mosque is built) unless it points EXACTLY at Mecca (a claim that was contradicted earlier this month by Saudi religious authorities). So what does Project Supervisor Joanne Hanley say when asked about the Mecca-orientation claim? The only thing that orients the memorial is the crash site. They are actively and knowingly covering up clear evidence of an ongoing al Qaeda sympathizing plot. Bad behavior indeed. To join our blogbursts, just send your blog’s url. An article posted at Jihad Watch brought Memri Special Dispatch – No. 2358 to my attention. Memri cited several interviews with Abbas Zaki,. Falestinian ambassador to Lebanon. As recently as May 7 he exposed the two state solution. Muslims will never cease their aggression because they are informed by As-Saff 10-12 that it is a “commerce that will save” them from eternal Hellfire and earn them admission to Paradise. The founder of their war cult prophesied that Jihad would be performed continuously until the end of the world. He also prophesied a final genocidal attack upon the Jews. To seal the deal, Moe issued an execration, threatening his successors saying that Allah would “make disgrace prevail over you” if they abandon Jihad in favor of productive agricultural pursuits. Mr. President, Madam Secretary, how do you answer these fatal facts? Which of them can you refute? What will you do about them? Why do you stubbornly demand that Israel commit national suicide? Every concession Israel makes and every “good will gesture” will be perceived as a sign of weakness, emboldening the Muslims and inviting them to redouble their attacks. Mr. President, Madam Secretary, President Thomas Jefferson said “Millions for defense, but not one cent for tribute.” Why are you paying millions to the Falestinians, with which they will buy new weapons with which to attack Israel? Exactly what part of this do you not comprehend? Only one process will bring peace and security to Israel: the process of making Islam extinct. Mr. President, Madam Secretary, why do you continue to waste lives, blood, money and time tinkering about the edges of the problem when only eliminating Islam will restore peace and security? You can nuke them or you can attack their ideology with the fatal facts I have presented and more which are readily available in Islam’s canon of scripture, tradition & jurisprudence so that shame will drive Muslims from the war cult in mass apostasy. Which will it be, Mr. President; or will you continue on your present idiotic, treasonous & suicidal course of action? From our founder’s new blog through Maggie’s Notebook, through a cross post at Radarsite, and cross posted here because it really belongs here. This post contains a vital message which will be too widely ignored. Read it and weep for America; for the liberty & prosperity we are losing forever bercause we put our trust in demogogues instead of statesmen. Please stop sending me letters begging me for money. I am no longer a member of the Republican Party. For years I was a member of the GOP because it was the closest political machine that represented my views as a Conservative Libertarian but that was too hard to explain to the idiots the federally run public indoctrination camps spits out these days, aka the Public School System. By the way, the American Public School System is unconstitutional. Try to locate the constitutionality of the Department of Education and what they are doing within the Constitution and I’ll go along with it. I won’t hold my breathe. I grow weary, no, I am passed that stage. I am ultimately sick and tired of getting letters with the opening lines asking me if I have given up on the GOP. That’s a dumb question and tugging on my heart strings doesn’t work. I have more integrity that that and I do not live by emotion – emotion does not drive me, my intellect does and these kinds of form letters insult me. I am not an emotionally driven Democrat. So, please stop. However, I do have emotions and it breaks my heart when I see this Nation slip into that abyss of obscurity because cowards will not stand for what they believe in and go along to get along. I came home from a war and for the first time I realized what the Vietnam Veterans experienced – a country lost and wallowing in the primordial ooze of a lost identity and a lost mission. The United States Constitution that I fought and bled for means nothing to you, apparently. If it did mean something to you, and it should because all of you swore the same Oath I did, you would be addressing each and every Bill in the confines, edicts and restrictions set forth in our Founding Document. Yet and alas, you do not. Why is that? I hear all of you debate and argue and not one of you – NOT ONE – even dare to mention the United States Constitution. Well, perhaps one of you does and, oddly enough, that is Senator Byrd that mentions it and waves it around before the CSPAN cameras and then promptly votes against it. Lip service disgusts me. Well, perhaps Ron Paul does also but he is the wrong guy for the right message. He just so happens to be wrong about some key Constitutional issues but that’s for another day. And, you don’t care anyway. And about that ill-founded statement about me abandoning the Republican Party. What Republican Party? The one going by the wayside of the Whigg Party, the Know Nothing Party? When I hear alleged Republicans say we have to move into the bigger tent and move further to the left, I have to ask myself, who is the idiot that is saying all of this? Move further to the left when others are saying that the GOP has moved to the far right? When did the GOP move into the Anarchist’s Camp? Did you do that while we were fighting the Jihadi? Is that why I hear we have to move left because we are all Anarchists now? What did I miss while I was fighting to keep you all warm and fuzzy at night? Perhaps you are all referring to those neocons. You know, those Democrats that moved into the GOP because they knew that running as a Conservative would guarantee a win and the Democrats, to this day, run “conservatives” against the “liberal” Republicans…and WIN. And you guys put a liberal Republican, ie John McCain up against another seasoned liberal? To what end? How did that work out for you, and the Nation? Does it make you proud that now, at this moment, a known Jihadi sympathizer, a known Communist is now in the position of acting President of the United States? An unknown? A nobody? A liberal so far to the left that Stalin would be proud? And you want to move FURTHER to the left? Have you lost your minds? And you ask me if I have abandoned you? You ask me if I have given up? You ask me for donations so that you can win elections by moving further to the left? I was, in fact, born in the early morning hours but, it wasn’t yesterday morning. I have watched time and time again as the RNC/GOP machine embrace, coddle, promote and support known liberal Republicans and have watched each one fail and lose elections or re-elections. I witnessed my Senator, John Cornyn, throw all of his weight behind that democrat in drag Arlen Specter. When I heard that, I fired off a letter telling Senator Cornyn that the last election was my last vote for him and now he is doing the same with yet another democrat in drag that is all of a sudden, like McCain, Graham and Cantor, talking about “conservatism” like they believe in it and live it. Please. I can spot a liar from 10 clicks. Cornyn is now supporting and throwing his weight behind Crist. Who has abandoned whom? You have got to kidding me. Is Crist now going to defect to the Democrat Party like Arlen Specter did? He should. What the RNC/GOP leadership ought to do but doesn’t have the moral fortitude to do, is purge the GOP of the democrats in drag and have their Party membership revoked, their membership cards sent through the shredder and have them take their neocon (old democrat) selves back to their first love, the Democrat Party. At least the enemy can be identified once more. It is nearly impossible to win a battle when the enemy cannot be clearly defined. When one takes a critical look at both main political parties, it is very hard to distinguish which one is more liberal than the other and it seems like each is trying to out-liberal the other. I watched the buffoons of the GOP act the court jester over the Terri Schiavo debacle – unconstitutional and an international embarrassment. I watch and behold grown men and women make fools of themselves in both parties acting like spoiled brats caring for one thing and one thing only – winning an election at all costs. With a complete disregard for the United States Constitution, both parties go after each other in a power struggle because one Party says they can do a better job than the other and neither is worth the powder to blow them all to hell. Neither Party argues or debates their policies with the Constitution in mind. When I witness people like Nancy Pelosi and Harry Reid say in the public domain, “The will of the Congress will be done” or, “The will of the Congress has been heard” and no one challenges them on that, something is seriously wrong and I have to question the mental capacity of those that have sworn to protect and defend the United States Constitution. Last I knew, it was the will of We The People that WILL be done and WILL be heard. We The People no longer have standing, so says SCOTUS. Excuse me? And the GOP says and does nothing of this? Do you support such nonsense? That very statement is unconstitutional and you ask me if I have abandoned you? I am a Soldier and you would not appreciate what I really have to say to you…perhaps one day face-to-face I will just to watch you tremble in shame. I’ll even show you my battle scars – the physical and psychological. And, you should be ashamed. You should be ashamed that the United States Constitution gets left out of the debates except for the convenient mention of it when the cameras are rolling and republican democrats in drag are railing about Big Tents and winning elections. Shame on you. Shame on you for giving lip service to border security. Shame on you for allowing two Border Patrol officers to be sent to prison because democrat in drag Sutton’s career enhancement was more important than two men that did their damn jobs and some socialist hack nobody gave the criminal a free pass and punished two men for doing their jobs. And the GOP did nothing until the very end…and that is unacceptable as well. Shame on President Bush and the GOP for that domestic and international embarrassment. Shame on you for fighting like little girly-men over the unconstitutional non-stimulus stimulus quagmire that no one read and not one of you in Congress challenged the constitutionality of it. Shame on you for even considering HR45. Shame on you for passing HR1388 and the equally unconstitutional Senate version. How is that constitutional again? Shame on you for passing HR1913 and soon S909. What is the constitutional authority for that again? Shame on you for NOT debating HR450, the Enumerated Powers Act of 2009. Why are you so afraid of that Bill? Is it forcing the federal government to actually adhere to the United States Constitution? Why are you so afraid of We The People? When Egypt signed a peace treaty with Israel, she was expelled from the Arab League. The Reagan Plan of 1982 would have Israel withdraw to the ’67 border, freeze settlement and allow an autonomous government in the territories. Prime Minister Begin’s response is informative. Yehuda Avner offers significant details about how the proposal was communicated to Begin, who was the last to learn of it. Mid East Web lists the points of the Fez Accord which was based on Prince Fahd’s plan, which I will try to distill down to its essentials. Guaranteed freedom of worship & ritual practice at holy places. Fallestinian self-determination & right of return. Independent Falestinian state with Jerusalem as it s capital. Security Council guarantee of peace. Security Council guarantee of implementation of these principles. When you launch a military adventure in hopes of gaining territory, you risk losing more than you gain. That risk is a significant disincentive to aggression. Why should Muslims be exempt from it? They declared a war of genocidal intent. They lost. They demand that territory, which they had illegally seized in ’48 and lost in ’67 when they attacked Israel again, be returned to them. That is avarice & arrogance, with no foundation on justice or equity. Israel was willing to return captured land in return for peace. Instead, the Arab League declared the three no’s outlined above. Jews have every right in justice and equity to live in the stolen land they recovered. Israel allows Muslims to live in her territory but Muslims demand that the land be judenrein. How do you justify the double standard? When Jordan illegally seized and annexed Jerusalem, Hussein guaranteed free access to holy sites, yet he barred Jews from their holy sites and desecrated cemeteries and synagogues. Why in Hell should Jews expect any better performance from his son and the UN? As pointed out earlier in Peace: in a Pig’s …, ‘Palestine’ & ‘Palestinians’ really refer to Israel & Jews. Falestinian claims to being a particular people, distinct from the mill run of Arabs with special national aspirations are entirely fraudulent. They had a right to stay put, they chose to leave in order to facilitate genocidal aggression against the Jews. Why should they be allowed to return to destroy Israel militarily or demographically? When and where has the UN been of any real benefit? Have they stopped any wars or prevented any genocides? Have they prevented Hezbollah from re-arming and firing rockets? Have they stopped Hamas rocket fire? Jerusalem was divided from ’48 to ’67. During that period, Jews were barred from the Temple Mount and their cemeteries & synagogues were desecrated, in contravention of King Hussein’s promise. Why should she revert to that condition? The Security Council can’t guarantee anything. It is a useless appendage, with Russia & China exercising veto power in support of their Arab dependencies. When did the Falestinians cease propagation of propaganda for war & incitement of terrorism? When did they take active & effective steps to stop terror attacks? When did they close the revolving prison door? When did they recognize Israel’s right to exist as a Jewish state? When did they quit chanting “from the river to the sea”? When did they quit honoring terrorists as martyrs? What makes anyone but a deluded fool think they ever will do any of those things? Victory: the Path to Peace exposes the foundation of Islamic aggression: Qir’an, hadith & Shari’ah. In the end, it all boils down to this. Only a total, absolute military and ideological victory; one which destroys Islam completely, can put an end to Jihad. This is the fatal fact of Islam which none dares contemplate. Nixon & Kissinger could not force peace. Reagan & Baker could not force peace. Clinton & Albright could not force peace. Bush , Powell & Rice could not force peace. Peace must come from total and absolute victory over Islam, it has no other source. While there is Islam, there is Jihad.You who believe that reforming Islamic governments, introducing democracy, educating the populace and abolishing poverty will end Jihad are blind, ignorant fools. Jihad is a mandatory sacrament, an eternal commandment of Allah’s perfected, immutable word. Jihad; holy fighting in Allah’s cause, is an intrinsic part of Islam; it is the Muslim’s “original religion“, and they are cursed if they abandon it. The victory must be so complete, total, intense and extensive that the remaining Muslims will recognize Islam for the fraud it is and abandon it completely. Until that happens, any peace will be partial, insecure and temporary. Ban Ki-Moon: Traitor or Buffoon? This is a companion piece to Peace: in a Pig’s … which includes more evidence of the centrality of conquest to Islam. It has critical quotes from Islamic law and links to two important articles published by World Net Daily. A UN Security Council press release issued May 11, ’09 illustrates their high achievement in institutional insanity, idiocy & corruption. It quotes Secretary General Ban Ki-moon thusly. He said there was a deep crisis of confidence among ordinary people on the ground, and for good reason. Palestinians continued to see unacceptable unilateral actions in East Jerusalem and the rest of the West Bank, such as house demolitions, intensified settlement construction, settler activity and oppressive restrictions on movement. “The time has come for Israel to fundamentally change its policies in this regard, as it has repeatedly promised to do, but not yet done.” On the other hand, ordinary Israelis continued to seek reassurance that a future Palestinian State would guarantee their right to live in peace and security. Indiscriminate Palestinian rocket attacks into southern Israel were not only deeply unacceptable, but counterproductive, and must stop. Israel needs some retaliatory mechanism for dealing with terrorism. The best retaliation is against the perpetrator and his immediate support base. Falestinian families need only curb their murdering offspring to preserve their homes from demolition. If they can’t control them, they should resort to honoricide. When your brat murders a Jew or two on his way to Hell and you celebrate as if it was his wedding day; when your media and ‘government’ honor him as a ‘martyr’, you should expect some pay back. Failure to retaliate is an open invitation to stage more terror attacks. UN kvetching about the only justice available to an aggrieved nation is an atrocious insult to common sense. Where the Hell are Jews supposed to live? You gave more than 75% of their patrimony to their enemies, who lost a little of it in another failed genocidal attack. Why in Hell shouldn’t Jews reside in King David’s capital city? By what right does the world seek to exclude Jews from their own homeland? Why should any part of Eretz Israel be Judenrein? When the road blocks are removed, Muslims infiltrate and murder Jews with guns, bombs, knives or axes. Every time Israel makes some insane ‘good will gesture’, the Muslims take advantage of it to murder more Jews. Evidently there is nothing intrinsically wrong with rocket attacks, they are perfectly acceptable if they are well aimed instead of random. An honest statesman would omit the qualifiers and issue an absolute condemnation of all attacks against civilian targets. The provisions of Council resolution 1860 (2009) must be fulfilled, he said. They included a durable and fully respected ceasefire; preventing the illicit supply of weapons into Gaza; reopening border crossings; and progress on Palestinian reconciliation under the legitimate Palestinian Authority. The Arab Peace Initiative remained a key framework within which a comprehensive approach to peace could and must be built. Islam does hudnas, not durable ceasefires; it is part of their tactics; to gain time to regroup and rearm. Muslims violate cease fires before the ink is dry on their promises. Can’t these treacherous fools read? So be not weak and ask not for peace (from the enemies of Islâm), while you are having the upper hand. Allâh is with you, and will never decrease the reward of your good deeds. Making war is a “good deed” for which Muslims will be rewarded with eternity in the celestial bordello. Making peace is a sin for which they will be condemned to Hellfire. How? No nation will send an effective force to close the smuggling tunnels. Egypt, who bears the primary responsibility, has not done it. It has never been done and will never be done. When the crossings are open, bombs explode on buses and in restaurants. Ban Ki-moon does not give a damn about the consequences, he just chants the mantra. The one thing they agree upon is the strategic objective: policide & genocide. Hamas and the PLO want power; the power to skim graft from the UN largess. They will not reconcile, and their reconciliation would have no benefit; it would not advance the cause of peace. There never was, is not now, and never will be a legitimate ‘Palestinian’ authority unless and until Israel expels the Muslims and annexes the territories. There is nothing legitimate about the Arab mobs nor the war lords who misrule them. There is no such thing; there is only a Muslim war initiative. First they start a war, next they dictate how it will end, all o nothing. Allah issued a command to attack, conquer and extort Jews. Asked which campaign to join, against Yemen or the Byzantine Province of Syria, which included Israel, Moe said “Go to Syria…”, explaining “Allah has on my account taken special charge of Syria and its people.”. In one prophecy, Moe implied that the Muslims can not obtain admission to Paradise without first killing the last Jew. He also said that Allah would continually torment the Jews through Muslim agency. And (remember) when your Lord declared that He would certainly keep on sending against them (i.e. the Jews), till the Day of Resurrection, those who would afflict them with a humiliating torment. Verily, your Lord is Quick in Retribution (for the disobedient, wicked) and certainly He is Oft­Forgiving, Most Merciful (for the obedient and those who beg Allâh’s Forgiveness). In his tafsir of that verse, Ibn Kathir reveals something that should send every Jew and Christian into paroxysms of execration. In the future, the Jews will support the Dajjal (False Messiah); and the Muslims, along with `Isa, son of Mary, will kill the Jews. This will occur just before the end of this world. There is only one: eliminate Islam. You can emancipate Allah’s slaves by causing mass apostasy or you can usher them into Hell. I prefer mass apostasy. Those primary sources are confirmed by Ibn Kathir’s Tafsir. Allah offers a ‘commerce’ which will save Muslims from spending eternity in the fire and gain them admission to Paradise. When your salvation is dependent on making war, you are not going to make peace! O You who believe! Shall I guide you to a commerce that will save you from a painful torment. 61:11. That you believe in Allâh and His Messenger (Muhammad ), and that you strive hard and fight in the Cause of Allâh with your wealth and your lives, that will be better for you, if you but know! 61:12. (If you do so) He will forgive you your sins, and admit you into Gardens under which rivers flow, and pleasant dwelling in Gardens of ‘Adn ­ Eternity [‘Adn (Edn) Paradise], that is indeed the great success. The restored state of Israel is living proof of the fact that Allah is an impotent idol whose promises are void. Now Allâh has lightened your (task), for He knows that there is weakness in you. So if there are of you a hundred steadfast persons, they shall overcome two hundred, and if there are a thousand of you, they shall overcome two thousand with the Leave of Allâh. And Allâh is with As-Sâbirin (the patient ones, etc.). See they not that We gradually reduce the land (of disbelievers, by giving it to the believers, in war victories) from its outlying borders. And Allâh judges, there is none to put back His Judgment and He is Swift at reckoning. That makes Israel the ultimate blasphemy; no faithful Muslim can tolerate her existence. There ain’t any! If there is a Muslim state or even a concentration of Muslims living within rocket range, Israel will be attacked. There is no other possibility. No peace treaty between Israel and Muslims will ever be enforced in the long run because Islam does not act in good faith. The Falestinians did not fulfill any of their Oslo Accord obligations and they have not met the demands of the road map. Any land ceded to the Falestinians will be used, as Gaza is, as a staging area for more attacks. There is no other possibility because Muslims do not act in good faith! From Secretary of State Clinton and President Obama to the Pope, it appears that all major actors on the world stage are singing the same siren song of land for peace. They claim that Israel must make painful concessions, giving Jerusalem and the West Bank to her enemy to use as a staging ground for further and more deadly attacks. What nation has ever gained real, lasting peace by making territorial concessions? Did ceding the Sudetenland to Hitler prevent the second world war? Did ceding Gaza to the Falestinians bring peace? Did it reduce the incidence of terrorism’ rocket & mortar attacks? The damned fools appear to be convinced that if we just throw Israel to the predators, Iran, Pakistan, etal. will fall into line and peace will prevail in Afghanistan & Iraq. Terrorism will cease and the world will be at peace. How is it possible for anyone to be so deluded; so far displaced from objective factual reality? Can this phenomenon be explained by anything short of a combination of ignorance, insanity & corruption? Observe these quotes from the relevant charters. Follow the links and read them both. How can peace be possible? The PLO and HAMAS are hellbent on reconquest. They will not make peace; they will redouble their attacks, just as they have following earlier concessions, because they will sense weakness and see victory just around the corner. The Islamic Resistance Movement believes that the land of Palestine is an Islamic Waqf consecrated for future Muslim generations until Judgement Day. It, or any part of it, should not be squandered: it, or any part of it, should not be given up. Neither a single Arab country nor all Arab countries, neither any king or president, nor all the kings and presidents, neither any organization nor all of them, be they Palestinian or Arab, possess the right to do that. Palestine is an Islamic Waqf land consecrated for Muslim generations until Judgement Day. This being so, who could claim to have the right to represent Muslim generations till Judgement Day? This is the law governing the land of Palestine in the Islamic Sharia (law) and the same goes for any land the Muslims have conquered by force, because during the times of (Islamic) conquests, the Muslims consecrated these lands to Muslim generations till the Day of Judgement. It happened like this: When the leaders of the Islamic armies conquered Syria and Iraq, they sent to the Caliph of the Muslims, Umar bin-el-Khatab, asking for his advice concerning the conquered land – whether they should divide it among the soldiers, or leave it for its owners, or what? After consultations and discussions between the Caliph of the Muslims, Omar bin-el-Khatab and companions of the Prophet, Allah bless him and grant him salvation, it was decided that the land should be left with its owners who could benefit by its fruit. As for the real ownership of the land and the land itself, it should be consecrated for Muslim generations till Judgement Day. Those who are on the land, are there only to benefit from its fruit. This Waqf remains as long as earth and heaven remain. Any procedure in contradiction to Islamic Sharia, where Palestine is concerned, is null and void.
. Those organizations intend to commit genocide & policide. Nothing less will satisfy them. Ignorant fools who do not understand the basic tenets of the enemy foolishly assume that the enemy will compromise, be satisfied and make peace. They will not, because they believe that they have a divine mandate to conquer and subjugate the entire world. In Islam, salvation: avoiding condemnation to eternal hellfire and obtaining admission to the eternal gardens of Paradise are functions of participation in Jihad. Obtaining possession of one of the best places in Paradise is a function of being killed in battle against Kuffar. Damned fools will doubt and disbelieve these facts; they will not verify the references. 9:38. O you who believe! What is the matter with you, that when you are asked to march forth in the Cause of Allâh (i.e. Jihâd) you cling heavily to the earth? Are you pleased with the life of this world rather than the Hereafter? But little is the enjoyment of the life of this world as compared with the Hereafter. 9:39. If you march not forth, He will punish you with a painful torment and will replace you by another people, and you cannot harm Him at all, and Allâh is Able to do all things. 61:10. O You who believe! Shall I guide you to a commerce that will save you from a painful torment. The Prophet (peace_be_upon_him) said: He who does not join the warlike expedition (jihad), or equip, or looks well after a warrior’s family when he is away, will be smitten by Allah with a sudden calamity. Yazid ibn Abdu Rabbihi said in his tradition: ‘before the Day of Resurrection”. Allah commanded Muslims to fight pagans until only Allah is worshiped on a global scale. He commanded Muslims to fight people with scriptural religions until they are subjugated and pay extortion. These are outcome oriented imperatives with no chronological or geographic limits. 8:38. Say to those who have disbelieved, if they cease (from disbelief) their past will be forgiven. But if they return (thereto), then the examples of those (punished) before them have already preceded (as a warning). The words are clear; their meaning is obvious on the face of the text. The obvious meaning is confirmed by Ibn Kathir’s Tafsir. Further confirmation is provided by Shari’ah: Umdat as-Salik. What does the caliph do and why does he do it? How frequently does he do it? O9.1[…]If none of those concerned perform jihad, and it does not happen at all, then everyone who is aware that it is obligatory is guilty of sin, if there was a possibility of having performed it. In the time of the Prophet (Allah bless him and give him peace) jihad was a communal obligation after his emigration (hijra) to Medina. As for subsequent times, there are two possible states in respect to non-Muslims. The first is when they are in their own countries, in which case jihad (def: o9.8) is a communal obligation, and this is what our author is speaking of when he says, “Jihad is a communal obligation,” meaning upon the Muslims each year. Jihad against Kuffar must be performed annually. If it is neglected, everyone who was aware of the obligation is a sinner. How can any sentient person, apprised of these fatal facts, assert that peace with Islam is possible? Anyone claiming that Islam will permit peace is either ignorant, insane or a liar. While there is Islam, there can be no peace, because Islam is permanent war! Not only is peace impossible to obtain without eliminating Islam, but the premises upon which the “peace process” is founded are entirely fraudulent. “Palestine” is a neologism imposed upon Israel by the Romans as an insult. Same place, different name. “Palestinian” means Jew! Those who falsely claim the fraudulent title of “Palestinian” are undifferentiated Arabs. Palestine Facts makes the relevant regional history available. Two World Net Daily articles contain vital information which is necessary to understand this crucial issue. We have all been had! Here is a vital excerpt from the second article. The Palestinian people does not exist. The creation of a Palestinian state is only a means for continuing our struggle against the state of Israel for our Arab unity. In reality today there is no difference between Jordanians, Palestinians, Syrians and Lebanese. Only for political and tactical reasons do we speak today about the existence of a Palestinian people, since Arab national interests demand that we posit the existence of a distinct “Palestinian people” to oppose Zionism. Masada2000 has the details of the fraudulent refugee claims here: Refugee scam, concentrate on the text, not the distracting images in the sidebar. If Binyamin Netanyahu is a statesman, not a politician, he will tell the demagogue, Barack Obama to go to Hell. A true statesman will not lead his nation into national suicide.